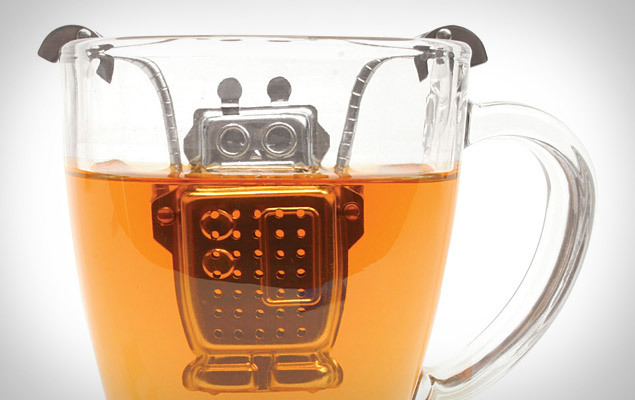 Husband got me a robot-shaped tea infuser. We are trying to figure out how to paint it pink without poisoning me. If that's really what it looks like, painting it should be easy enough. I'm assuming the tea is dispensed through those holes, right? If you're going to paint it, make sure to cover up any part that might get paint inside of it. (I'd recommend cut-up Ziplock bags and painter's tape for this) If there's enough paint-able space left on it, you can use a can of Krylon and spray paint it, which would make this much faster, if not, it's probably be best to use a brush. Either way, be sure to lay down at least two coats of paint on it, added by another layer or two of clear-coat to keep the paint from flaking into your tea cup. Let it sit for 12 to 18 hours after you lay down the last layer of clear coat (one layer would work fine, two would be better), then enjoy! I'd recommend adding that smiley face on it, too, while you're at it. For more Tiny Pink Robots!! I was absolutly sold on getting that one...until I saw the Tea-Rex! Painting it pink... that reminds me of my bike when I was a kid. It was blue, so I spray painted it pink. Not sure why I went for pink (it's not my favorite color), maybe it was the color we had available. Anyway, I accidentally got the tires, so I mottled them pink, too. Wow, thats the smartest idea ever.